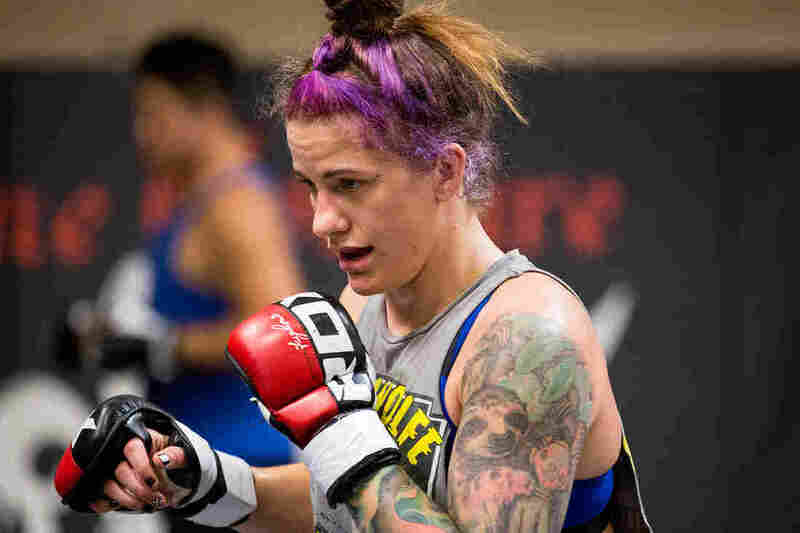 Concussions May Hit Female Brains Harder, Research Suggests : Shots - Health News Gina "Danger" Mazany is a professional mixed martial arts athlete, and she's helping researchers learn more about head injuries and the female brain. Professional fighter Gina Mazany practices during a training session at Xtreme Couture Mixed Martial Arts in Las Vegas. She well remembers her first concussion — which came in her first fight. "I was throwing up that night," Mazany says. Thanks to research on boxers and football players, both athletes and the public are becoming more aware of the dangers of sports-related head injuries. Yet there is little data on participants like Mazany. That's because, unlike the vast majority of athletes studied, she is a woman. "We classically have always known the male response to brain injury," says Mark Burns, at Georgetown University. But there have been remarkably few studies of females. The bias runs throughout the scientific literature, even in studies of mice. "Male mice have been used historically in research and not really been compared to female mice," he says. That's changing now. The National Institutes of Health recently began to require scientists to include female animals. Burns' lab has begun using both sexes in research on head injuries. And they're finding some differences. This summer, Burns published a study in the journal Glia that looked at mice with severe brain injuries. He says the brains of male mice showed a massive immune response within a day, but the female response was much slower — up to seven days. There have been hints of differences in people as well. Just this year, a study of college athletes found that women are more likely than men to get concussions. But to find out more, scientists want to study fighters like Mazany. She is 28 now and lives in Las Vegas. She's a professional mixed martial arts fighter who competes in Ultimate Fighting Championship events. Her nickname is "Danger." Mazany has begun worrying about her brain. "One day I want to get married and have a family. And I want to be able to take care of my babies and like all that kind of stuff," she says. "So I'm not going to get the s*** kicked out of me for nothing, if that makes sense." So Mazany volunteered to be part of a study of fighters at the Cleveland Clinic Lou Ruvo Center for Brain Health, in Vegas. For six years now, professional fighters have been coming to the center for brain scans and blood work. They also complete tests of mental functions. On the day of Mazany's annual checkup, she is subjected to a battery of tests that assess her balance, reaction time, memory, and thinking. After about 40 minutes, Mazany meets with Dr. Charles Bernick, the scientist in charge of the fighters study. They move to a quiet room. Bernick scans a chart. It shows Mazany's test results over the past few years. "Well you're pretty stable," Bernick says. There's no obvious sign of trouble from her fighting career, at least not yet. Bernick says the study of fighters like Mazany now includes nearly 700 men and about 60 women. "So, [the women are] still a minority, because they are a minority in the sport," he says. "But I think it's a very important group to evaluate because we really don't know if there are differences between men and women." Bernick does believe that there's now enough evidence to suggest real differences between the ways men and women respond to head injuries. "Women may be more likely to suffer concussion. Their symptoms may linger longer," he says. "The question is: Is that because women are just more likely to report injuries, or is there a biological higher vulnerability." Researchers have suggested some reasons women might be more vulnerable. They tend to have weaker neck muscles. So a head impact might shake the brain more violently. And hormonal differences might affect the brain's response to an impact or injury. Bernick says the fighters' study offers a way to directly compare men and women who compete in combat sports where a concussion is often the goal. He says the study has already shown that brain scans and other tests can show who's been getting hit a lot. "You can detect changes in brain structure even over a year's period," he says. "The question really is in the long run, are those changes predictors of somebody who is going to have a neurodegenerative disease later in life." Bernick says an answer is still years away. In the meantime, Gina Mazany is trying to stay safe while also staying competitive. 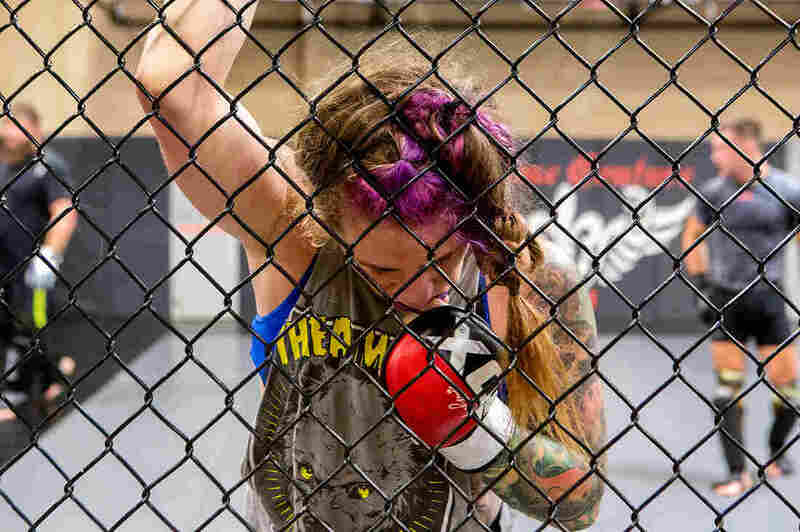 During her training sessions at the Xtreme Couture mixed martial arts center, Mazany tries not to give anyone a head injury, though things can happen during sparring: "I have knocked out another girl in my gym on accident," she says. "Sorry, Hannah." But Mazany says these days, most fighters know what they're doing is risky. "My theory to it all is yeah, there's brain damage. Yeah, this sport is not safe. I don't care who you are, it's not safe," she says. "But a lot of things that we do aren't safe."